Michaela: Welcome back to the show. 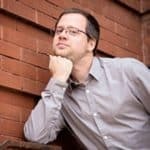 I'm here with Miles Rausch and that name is somewhat dramatic or Luxembourg and we'll talk about that in the moment but Miles is talking of CF objective on Progressive Web App building and he's doing it using Lucee, CFML, and Coal box and a bit of Command box and we'll talk about that in the episode. But we'll look at what a Progressive Web app is and why you want to be doing that with your apps. And why you shouldn't be trust in your client's network connection to be always on. And who's leading the charge in this Progressive Web App Movement. And who's a bit left behind and how it relates the offline burst and he said online there is offline burst movement that Google has championed over the years. So welcome Miles. Miles: Thank you Michael. Thanks for having me. Michaela: So I think the question here for people who haven't created a Progressive Web App is what on earth is a Progressive Web App and have they ever used one without knowing it? Miles: Well if you are a fan or user of Google products chances are you come across at least one or more of their Progressive Web Apps. What a Progressive Web App loosely is, is a set of web technologies designed to give users more of a Native Application Experience. You know we get this promise when the iPhone came out from Steve Jobs who said that they would need an app store because your websites would be your apps and Apple kind of failed to deliver on that promise at that moment. But now others and especially Google have taken up the mantle of how do we give users the experience that they've really come to expect and enjoy using native apps but do it in open way by getting Developers, Browser manufacturers and Standards bodies to kind of agree on some technologies that can be created out in the open to deliver on those promises. So it kind of combines things like, caching an offline first experience that caches content for you. We believe that you have this on the background of the browser so that the user interface of your website is free to do what it needs to without being blocked by this background work. And then serve also offering things like add the home screen or an install banner or those other kind of features that really have become standard in native apps but doing it on the web instead. Michaela: So everyone here probably has used Google Docs or other apps and maybe they've even taken that risk of editing a Google doc when they're not online. I know the first time I did that when I was on a plane flight; I kind of had my fingers crossed that it was going to lose with thousands of words I was typing. Michaela: It did seem to work pretty good. So what you're saying is if we have apps we're creating we can make those progressive as well? Miles: Yeah and you know and the key to Progressive Web Apps is that they enhance an existing website. It's not changing the way you make websites now it's adding a new layer of functionality on top of it that progresses it into more of an app experience and that sense it makes it really easy to take even just the simple marketing website and give it what we feel as these fancy features of being offline enabled having all that's the stuff offline cache and giving it these you know low patterns when people install it in their home screen and those kind of things. But yeah, I mean that the Google has been working in this realm for a very long time and now the APIs are going to where even I would say even a beginner who has some experience with Front End Development, can get their site offline enabled pretty quickly and that's what I hope to show with my talk to with the demo I do at the end is taking a simple website, built with Coal box and Lucee, and running on Command Box online machine and showing how I can enhance that using these technologies. Michaela: That sounds really valuable to do but if someone was trying to justify this to their manager, you know why the heck I should make this app progressive. What could they say to them? Miles: Well I think managers like to see case studies, you know they like to see a proven in the industry and in my talk, I do briefly touch on two really compelling story. And one is, Forbes and they have each a video out that they produced that talks about the sort of improvements they got. And I don't remember the numbers off hand but they increased user engagement, the amount of time users spent on their sites and the number of times people returned to the site because if you cache everything they are presenting to your user, everything will load faster that's just the nature of you know networking and download and bandwidth and all those other things we kind of contend with on the network. And so you see a better user engagement because as we know the longer a user has to wait for content on your site the more chance that gives them to second guess coming to your site at all or as a competitor. And so by adopting these techniques you make a faster Website just by the nature of how these technologies work and then that end up converting into a better user experience. The other case study which is really interesting a lot's been written about this online, is Twitter is recent relaunch of what they call Twitter lites and they’re did the sort of mobile experience of Twitter as a Progressive Web App. And they've been seeing a lot of increase user engagement and usage. Increase load speeds and for Twitter, they haven't always had a great user experience back to me fair well days back now ten years ago. To take their mobile experience to make it a Progressive Web App, they've seen astounding results of that too, so you know I'd say, not only should a good indicator be the companies they're backing this like Google who they do a lot of experimentation but they don't put these many of their developers, these many resources behind something trivially you know they use that as a backup these moves that they make. But then also these individual case studies are two really high profile companies have really great results with Progressive Web Apps. Michael: So we'll put the links to those in the show notes for that YouTube video and any other case studies we can find there so people can reference them. Miles: Yeah like Google has, Google does have I like a Progressive Web App showcase, serve many sites that they did that had more than just those two examples. I can give you the link to that whole gallery and that will give people a lot of examples to look at. Michaela: Fabulous! Well we'll put that in the show notes along with every other thing we mentioned in the show. So. I guess one of the questions here is you know I think developers traditionally assume that there users are going to have internet connectivity the whole time so why shouldn't you trust your users internet connectivity 100 percent of the time? Miles: Well, I think there's kind of two ways to look at the benefits to the Offline First story, you know one is that a lot of companies international companies in particular are seeing these emerging markets, you know all of these companies that are based in the U.S. they looking at emerging markets in China in India and Africa. And they see that these are people who are, have grown up with this kind of technology. But usually in the forms of feature phones rather than smart phones and in the form of really spotty networks not you know LTE or 4G networks like tend to happen more in more industrialized countries. So by adopting these technologies you can give those users a really premium experience at a relatively low cost because they're starting to get cheaper versions of smart phones with the same technology that expensive smart phones have and by making your site progressively enhanced. You can then sort of work around those network limitations that they have over there and then you bring those people on your cloud form because they have such a good experience but it's was that you know a relatively low investment for you to handle that sort of huge Achilles' heel of a poor network. But saying, say you are not international, say you focus on one country that does have a really good Internet connection. You still have moments where your customers will not be connected. So maybe they're on a flight, like we talked about before, you don't always have either any connection or really expensive and not great connectivity, this same technology has worked for that use case as well you know, either it's someone's disconnecting when they usually have a good connection or someone who rarely have a good connection but either way people don't have network all the time things happen, disasters happen, Inconveniences happen. And if your app is just built in a way that assumes the network is optional then you protect yourself against those would be cases and then you also give them a better experience anyway, so you kind of help solve the two issues. Michaela: Well that makes a lot of sense. So having decided we're going to try out one of these progressive apps, who's leading the charge in the progressive app movement and what companies are kind of left behind on that? Miles: So I've mentioned them a couple times but Google has really been at the fore front of this. They have a unique position in that they are a creator of web apps and websites and they're also a creator of a web browser and so they can sort of work this problem from both angles. They can get developers on board and easily connect them to you know the chrome and then even the Android teams on the browser side and figure out what makes sense for both of these two parties? You know and a lot of people who work at Google and Mozilla and Microsoft are taking part in these standards groups to really nail down what these APIs look like so that everyone's in agreement with how they should work and thinking through the edge cases and the potential fall backs but then also the benefits and then Google's been all in on supporting that on their Android phones, the Android browsers and the Chrome browser across all those platforms that they are launched on. Microsoft is another company that's doing a lot of good work on this. New windows ten has some good support for Progressive Web Apps built even into their windows store where you can develop an app for the store that's based on web technologies. And they've been a sort of ensuring that those apps that get the Progressive Web App features that go into the store that they can expect in the browser. Unfortunately kind of quiet on this front is the Apple Browser team you know Safari, mobile Safari have. They've been kind of lagging behind. Miles: They don't support nearly as many features as the Android handsets do and you know, you have to kind of, It's nice that you can progressively enhance these stuff so you're not making a broken app if your users use those technologies but it would be nice to have them be more part of this whole journey than they seem to be. Michaela: And how about Adobe and Lucee? Miles: In terms of Progressive Web storing? Michaela: Yeah, well in terms of supporting creating Progressive Web Apps? Miles: Well in terms of the role that Lucy was playing you know, Progressive Web Apps are really a client side enhancement and so by definition and may work perfectly with any sort of several language you choose to use because they enhance on top of that. So I'm not aware of anything specifically that Lucy would play as a role on this but I'm certain that the members of the organization would be in favor of this kind of thing and there's a lot of things built into Lucy that make it easy to sort of you know, to make these AJAX calls to sort of synchronize your data when you need to when you're back on line. You know being able to expose the CFC using the remote leverage extremely handy functionality the kind of use that without any extra setup to you know apply sort of synchronization event in your app. Think Adobe, I wouldn't be surprised if they you know seeing the light and playing in this role too. If they don't make a browser per se, lot of the things they produce like Photoshop are native applications rather than web applications but they do still have a suite of web tools for producing things and I can't speak for them specifically but I would hope that they're looking at or even playing an active role and providing tools for developers front end and back end to support Progressive Web Apps. Michaela: And then I think I heard you say Firefox browser supports this as well? Miles: Yes, and the Mozilla team. They have and I've seen representatives from there on these standards bodies popping out these features. So, Mozilla and Chrome are sort of step in step with supporting these things with the importance that they bring and especially with Mozilla and you know there sort of outreach mission you know I think they're very compelled by the story of people in areas where there is not a good consistent network and making that experience better and more open and so they're very much a part of this as well. Michaela: And then you know I know there was offline first movement, how does that relate to this? Miles: So the Offline First Movement is a bit older than the Progressive Web App Movement, and in many ways was kind of the ancestor of it. From what I've seen as I've been following the Offline First Movement is that it really sort of inspired and kind of became Progressive Web Apps. You know offline, it's one aspect of what we call Progressive Web Apps and that story's been there for a long time and then the Progressive Web Apps have ironically not progressively enhanced that story of Offline First to add things like loading screens, installed banners at the home screen functionality and summits web push notifications to is another big API adding that to the Progressive Web App suite technologies. Michaela: So it will kind of comes together with Progressive Web Apps and it sounds like, how many years is this whole movement been going now? Miles: That's a good question. I think I remember first experiencing a sort of Google product that attempted something like this. I think it's been years and years ago you know, five or maybe ten years back that Google's been trying to double down on web applications and making that the sort of primary way of reaching customers. The sort of Offline First Movement. I first started to notice maybe four or five years ago at the thing that was really sort of making progress and making noise and then Progressive Web Apps have been as a term used newer than that maybe two or three. And maybe it's just that when I noticed that it had already been around for a little bit but you know we've really been seeing the majority of this movement in the past five years and especially in the last year or two, it seems to have really caught fire and really picked up speed. And then gotten you know people interested from all different kinds of companies that have all different kinds of customers. Michaela: Well it sounds like an Internet years that's a pretty much technology and exciting to get involved in it now. I think I am more concerned if I create a Progressive Web App, what happens if the client's device? You know whether it's a laptop based browser or a cell phone. What happens if there device crashes while they've made a whole bunch of edits and they're offline? But by and large these things are all asynchronous and background workers being in their own thread can then work very efficiently and very quickly and so. Unless there's a bug in your code causing that crash at that moment you should be in a pretty good place you know but of course it all comes down to, if the developer is developing good code, and is making those assurances. But yeah I think the asynchronous nature of the background working of the service worker, these were all decisions they made in developing these APIs. And they made them for a reason and help support certain parts to developer that helped recover from those kind if situations much more easily than what older technologies would have reported. And so that cache the stuff stop then and send it to the server and then when all the work is done you can send a message back to the UI saying, “Hey tell the user that I took care of their job for them” and then the user can interact with it from that point but it's been all sort of decoupled and because these layers has been, like I keep saying you get to progressively enhance your website. If someone doesn't have any of these technologies in their browser your website still works because you still have that website you started with it's just its progressively enhanced it another layer on top. Michaela: So those who have used Google Docs, there's a little thing where it says all change is saved in drive or all change is saved offline. There's a time period when you're typing furiously where it may actually be you know it kind of still saving the stuff but it kind of the UI can't tell me where stuff, what's being done with the data you've entered? Miles: Yeah and that's you know is this the sort of message passing back and forth the UI can sort of queue messages to the service worker and the service worker, even if it's doing a ton of work on those things getting them ready to go to a server that won't interrupt your flow so you can type seriously and you don't shouldn't see a lag because the service workers working, it will just do what it needs to do in the back. Michaela: So in your talk, CF objectives you are going to show some code using Lucee CFML and Code box maybe using a bit of clever stuff and command box. Tell us a bit about, you know how you have implemented this using those technologies. And then at the start of the site that am going to use for the demo and then I have the project going, get up and gets you know different branches that serve step through different enhancement that I made along the way. So you can see the sort early first step of adding a service worker and also explain what the code means and how put it together and do some experimentation with how you can use Chromes Dev tools to really nicely sort of inspect and debug your service worker. And then even emulate an offline entirely offline experience with the check of a box. And then I get two more versions of that where I just keep adding features and showing certain pitfalls may be you'd run into and how we enhance around that. So as long as I get my slide back to also be offline enabled and I would definitely be ready for the demo parts and the slide part as well, as their wifi isn't as good as it could be. Michaela: And your slide deck is in Google presentations or? Miles: I use a web app called slides.com and they have a way where you can, your presentation is built on web technologies and they have a way for you to download it and so that's usually what I ended up doing in the past and just to have a local copy so that I can run it my browser and not have to worry about spotty wifi. Michaela: So you're going to be brave in the stem own actually pull the plug on the Internet connectivity during the demo? Miles: Yeah I'll show, now it'll be people have to believe me a little because I'll be running the command box server locally as well but I'll show them how Chrome dev tools has a box called offline and that would basically it basically simulates being offline by telling Chrome, “Hey in this tab you can't load anything from a network” and so you can actually see how things don't download from the network how you get you know broken images, and stuff like that unless you got your site set up to be offline enabled. Michaela: Cool! And why did you pick you know co box to do this in, does it help out with creating this kind of app or? Miles: You know cope with press of web apps since they enhance top of whatever server line that you have. You know, no one [inaudible] [29:20] framework is better suited than another. But I use Co box, I've used it first in site here at work. I really like the way it works and the [inaudible] [29:32] solutions team does a good job with it. So it was really easy for me to just use command box to install the framework in the site and really easy to get the views I needed and the hands notes. Michaela: And what do you like about command box. And just maybe tell people listening what the heck Command box is in case they didn't know? Miles: Sure, Command Box is a sort of package manager and command line tool for Lucy and Adobe ColdFusion. They comes out of the Order Solutions Team I think Brad Wood is the Primary developer, the lead developer on it. It basically gives you the power of CFML from your command line from a really easy to install executable, that works great on all platforms. I use it personally on a Windows machine here at work and on Mac is what I'll be using in my presentation. So it works perfectly in both and especially anyone who is in save a note community you know this MPM and Yarn as really great command line tools for those languages and technologies and command box I think took a note from how those work and makes it really easy to not only create these packages and CFML so like reusable boxes of code that you could use in multiple projects if you wanted but then also to just fire up CFML servers adhoc whenever you need them just by from the command line going to that folder and typing box start and then you have a Lucy server or Adobe ColdFusion server starting in that folder ready to execute your CFML code for you. Michaela: And the really cool thing is that you didn't have to download the latest version of that you know Adobe ColdFusion. Say you wanted to test your code in CF9 or CF2016 or Lucee5 or whatever you just tell it you want to run it in that version and it deals with getting the latest version of it. Miles: Yeah, it handles engine download, engine switching like a charm I mean and that's really key when you have maybe different versions of these engines that you're working with and you want to see what us the sites that work on CF9, what is the sites that work on the latest Adobe CF or if you're working with Lucy and you want to see, “Hey I wrote this for Lucy4.5 but we want to switch to 5 that's the sites that work” I mean command box makes it that simple the switch engine as well as command line parameter so yeah it's a god send, we use it all the time. Michaela: And in addition when you said command line, you can run individual you know commands if you need to but you also can write a whole script run inside command box so instead of writing you know what we used to do batch files years ago, you can write up stuff to automate things Coldfusion code? Miles: Yeah, not only can you just, this is turning a little bit into a command box commercial but it's a great tool. Michaela: Well, it's a free tool it's open source, I think were allowed to do you know. I don't mind telling people about cool software, I don't mind paid or not. But in this case like it's free, gee. Michaela: I think they deserve a lot of love given back to spread the message that command box is cool. Miles: I mean command box is the tool and I've been doing some sort of CFML development now for I think about ten years. And command box the tool that I wanted ten years ago. And it makes the whole user experience of working with either Adobe ColdFusion or Lucee just so refined, it just makes it such a happier experience because you don't have to figure out where do I install the thing you know especially if you're not used to working with JBM languages there can be a whole sense of I have to get what Tomcat. What's Tomcat? And I have to this and put this where and where do I put my file that you know can be so many steps just to get your writing the CFML code but with command box it's just a command and you are terminal and then you're up and running. Michaela: That is amazing. And I notice there's a Progressive Web App Dev Summit as well that Google puts on. Did you go to that or attend it online or? Miles: No I haven't I think I've watched some of the videos and I know they did a whole Progressive Web App track that Google IO but yeah part of choosing this talk, part of submitting this talk was I've been watching Progressive Web App technologies for a while. But hadn't devoted the time to figuring out how it works, and how to implement it and I knew that if I submitted a talk on that I would have to figure this stuff out and pretty quick time. So it became a good motivator to really dig in and read every article I could find and watch videos and really sort of dig into the guts of how these technologies work and what features are enabling developers to utilize. But I've not yet had the opportunity to go to a conference or hear very many talks in person on the topic yeah. Hopefully this coming year. Michaela: But they are recorded so you can go on the link would put it in the show notes and have a look at some of these stuff you want to dive into it more detailed, so it is good stuff. So let's change gears a little bit now and I know you and your company moved to use Lucee CFML a while back. So tell us a bit about that Miles. Why you moved, and how that move was? Miles: So we first started exploring the idea of open source, CFML about five years ago. 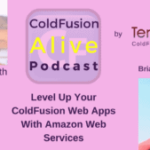 And we were looking at how the performance we were getting out of some of our Adobe ColdFusion sites wasn't what we thought it should be. We are trying to figure out where the issues could be coming from and since we were doing all this sort of you know, server tweaking and updating to try to narrow in on these issues. I've been hearing a lot about open source CFML engines and Ryo was the sort of running contender that we've been hearing about. Some of the other developers were hearing about those too when we can talk to our Search Server Administrator and we got a Ryo server still up and running and we put some code on it and we made a couple adjustment in order to get it to run. Because back then their innocence five years ago and so a lot changed since then but we had to make these couple of minor changes since the code bases were pretty old but once we did and we compare it to performance it was sort of night and day difference. And it didn't take long to see the benefits of Ryo been that it's built in the open, using open source. Been that the group behind it was responsive and visible. You know you had people they could reach out to not just a sort of large company that you had to interact with and then when Lucy sort of branched out from Ryo, we really quickly moved to that and we really haven't looked back since. I'm all our sites pretty much run a Lucee. Our local developments run on Lucy, we've contributed codes to the Lucee project and the documentation projects and it's been a real nine day difference and our sites perform and just our developer efficiency and performance. 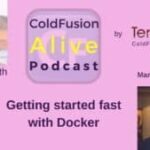 Michaela: And was moving the code between those versions ColdFusion a lot of hard work or did it pretty much run out of the box or? Miles: It all depended on the project you know with the if you have older project that was written in say you know CF5 days or if you have really old code and the Ryo and Lucy code bases weren't necessarily written to go all the way back in Adobe ColdFusion history and so we would find that our Adobe code was getting away with things that weren't good practice anymore and were frowned upon that Ryo and Lucee were saying, “No that's not quite right”. And so those older pieces we had to modernize to fit with Lucy but you know none of the stuff that we had written the year we switched had any issue because it was all using best practices and so it was good code, it was a lot better code than would have been before and anything now that we write you know anything new that we convert over it’s pain free it just comes across because it's all top modern web application. Michaela: Cool! So let's have a look at why you're proud to you CFML? 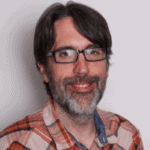 Miles: I think if CFML especially the, am a big proponent of open source and open development Progressive Web Apps are built on that sort of backbone of being out in the open and hearing everyone's voice. You know and the open source CFML movement and you know for us Lucy in particular brings the comforts of a language that's extremely easy to get up and running with to sort of dig into for the first time and there puts it on an engine that is open to anyone to help improve and contribute to. I think we really see a open source languages as having taken over so much of the Internet because people want to have ownership. They want to be able to not only share in the sense of you know the common wealth of humanity and improving everyone to you know all boats rise higher but then also they have an ownership on that product and they feel like if there's a problem with it, there's a lot of people looking at it. Either a lot of people having it and then complaining about it through open source to get systems but then an equal number of people who have the capacity but also the expertise to step in and fix that and that's I think the true power of open source is that it makes a better product over and over and over again. And CFML has a unique story as I put it in that. It's a really easy language to get up and running with and especially with something like command box, it doesn't take much to actually start running CFML on a local laptop or desktop machine and if the syntax is look really straightforward especially if you work with tags. Even the script syntax you know share so much in common with the really popular C Based style languages that really anyone can pick up CFML who whether they're a developer or not with just little bit of training and maybe some guidance on the way. Michaela: Yeah, I think I'd agree with that. It's very easy to get into on the other hand it doesn't… If you want to do lots of deep computer science type level stuff like you know Progressive Web Apps or other [inaudible] [43:48] orientated things. ColdFusion would let’s you do that. It's easy to get into and it's powerful so. Miles: Yeah, well and with its unique ability to jump into the Java Layer too, I mean you can really then dig into extremely complicated computer science to start, you know it's almost like you pull up in a skate hatch and get down into all these sort of gritty machinery to muck up around and really develop something interesting in Computer Science if you want to put it that way. Michaela: So sometimes we read about thread saying ColdFusion is dying. But I've been reading those for over ten years and it still seems alive. 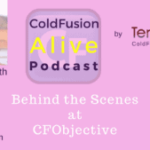 But what would it take to make ColdFusion even more lives this year in your opinion? Miles: I pin the hopes of CFML in general. I think there's a lot of promise like I said in the open source versions of it. And I really see that story as has being necessary for the promotion of the language because I think while Adobe ColdFusion has its developer Edition and you can get that here it's something like command box, I think that the open source Lucee CFML engine is really where new blood's going to come in and where you're going to get new interests and use cases for it. And I think it's a matter of sort of people who have a vested interest in that doing what they can to promote it, and to showcase that they utilize it in their projects. There's not necessarily a lot of that of saying just, “Hey we built this cool thing and we it using Lucy” and then that would get other people interested in, “I like that cool website. Oh and it's built using Lucee. I wonder what that is?” And then being able to jump over to the Association website and learn more about the language and then hopefully see how easy it is to get working with it on your local machine and take it from there. Michaela: So maybe we need like a little competition for who's built sites in ColdFusion and make a page that lists all the cool ones out there to encourage people to promote their site and you know put a link to what the technology they used on there about page or something to help get the word out on it. Those sound like some really cool things to do. Miles: Yeah, that'd interesting a sort of showcase website of work you know best and brightest that CFML has produced. Michaela: And I really like you know looking at some of this progressive stuff that you're talking about Google does a great job of having case studies. 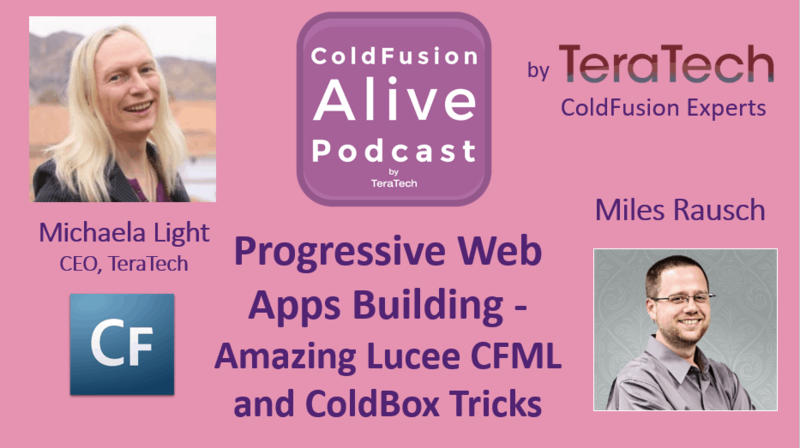 You know about progressive apps and maybe ColdFusion need some case studies of you know things have been done not just listing the website but going into the neat things they were able to achieve using this technology and how they were able to do it better? Miles: Well and there's definitely no shortage of really intelligent people working in this community, it's just we don't seem to be doing a great job of talking about the things that we do and really showcasing interesting and complex and fascinating things we're doing with the language. So yeah, I think there's bound to be stuff for that. Michaela: Cool! So what are you looking forward to at CFML objective? Miles: Well what I look forward to every time I come to CFML objective is to learning something new. I like learning and growing. And that's part of why I chose this topic to speak on so that I would be forced to learn as much about it as possible. And so I'm looking forward to just whatever random thing that maybe I've never even heard of before, people come there to share and really sort of expand my world of you know what I know about web technology and web development, so. And hanging out with the fun people that we hang out with last year. It's always a blast too. Michaela: And a chance to get out of North Dakota where you are now and visit Washington D.C. and maybe see someone historic monuments and other stuff that's in the nation's capital? Miles: Yeah that would be nice too. It would be, I'm sure it will be maybe a little hotter than it is in South Dakota right now. But it's definitely going to have a lot more people and things to see. Michaela: Cool! So if people wanted to find you online, what’s the best ways to find you Miles? Miles: So I blog, I have a personal website milesrausch.com, my Twitter handle is @awayken and you know you'd probably find me on Linked In too, my name Myles Rausch Millington but I've been trying to blog more about web development topic and so a couple my recent posts are kind of along those lines. I tweet here and there when a random thought jumps into my head and seems like the Internet needs to hear it and i would put that out on Twitter, so you can find me there. Michaela: Great! Well thanks so much for being on the CFML Live Podcast.